The Primary Education module is designed to follow the axiom “Discovering the syllabus is more important than covering it”. We believe that the student should have mental access to assimilation along with physical access to learning. 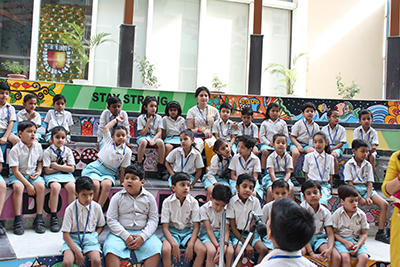 The Primary Curriculum at Manthan is driven by the natural curiosity amongst children as per appropriate age group. At Primary level, we integrate the curriculum with NCERT (National Council of Education, Research and Training). They share their experiences and ideas, enhance their sense of discipline and varied existence of community through interactions with different kinds of people and objects in their neighbourhood and environment. The curriculum recognizes the importance of developing the full potential of the child. It seeks to develop children spiritually and morally and to foster in each child an ethical sense that enables him/ her to acquire values on which they should base choices and form attitudes; it endeavors to equip children with the knowledge and skills that will serve them not only in their lives as children but later as adults; it is concerned to develop their capacity for creative expression and response and it promotes their emotional and physical development. 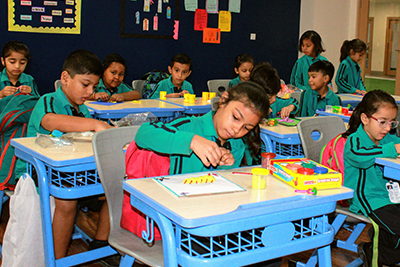 Grade 1 and 2 follow a well-balanced academic curriculum with English, Hindi, E.V.S. & Maths as the core subjects and Computer Science, General Knowledge, Music, Dance, Art & Craft and Physical Education as essential support subjects. Computer Aided Learning through Smart Class and numerous other activities form an integral part of the teaching learning process. A period per week is allocated in the Time Table for Value Education. To encourage reading habits Library period is provided, Class Library is also maintained and DEAR (drop everything and read) time is introduced. In Grade 3, 4 and 5 in the place of Environmental Studies, there is a segregation of Science and Social Science which are two well defined subjects. Privacy & Policy | Copyright The Manthan School 2018 | Designed By Thinkovative Pvt. Ltd.